ATLANTA, GA--(Marketwired - July 11, 2016) - Matrix Health, a worldwide provider of customizable online portals for healthcare providers, announced today that it has added Nucleus Medical Media, Inc., to its extensive roster of industry-leading content partners. The addition of Nucleus will bring medical illustrations, animations, and interactive media to the Matrix product offering. Nucleus' collection of highly specialized, visual content details human anatomy and physiology as well as surgical procedures and disease progressions. With Nucleus as a partner, Matrix Health will be able to provide its clients access to an extensive library of expert-reviewed medical visual content. "Matrix Health strives to include the very best medical content as part of its educational portal," said Dr. Pramodh Nathaniel, Managing Director of Matrix Health. 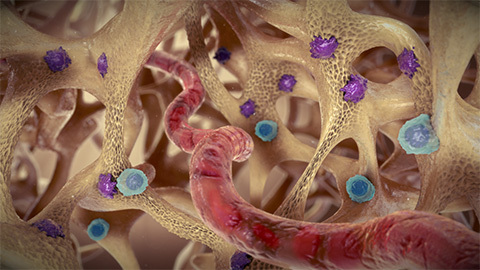 "Nucleus Medical Media's animations are beautiful and engaging as well as factual. The addition of these animations will add a degree of sophistication that is new to our current market." "We're pleased to partner with Matrix Health to provide our extensive content collection to the global healthcare community," said Ron Collins, CEO and co-founder of Nucleus Medical Media, Inc. "Communicating medical information clearly is always challenging. Medicine is a visual science, and visual content simply makes it easier to understand health information." Nucleus employs a staff of illustrators and animators with professional degrees from medical and technological institutions, including the Johns Hopkins University School of Medicine, the Medical College of Georgia, the University of Toronto and the Rochester Institute of Technology. Founded in 1997, Nucleus Medical Media, Inc. is an award-winning creator and licensor of medical illustrations, medical animations, and interactive multimedia for the publishing, legal, healthcare, entertainment, pharmaceutical, medical device, and academic markets. Additional information about the company can be found at www.nucleushealth.com.